Galaxy Fold’s full screen features an interesting design: there is a small screen on the cover of the phone for easy access. But whenever a larger screen is needed, you can open the phone just like you’d open a book. You will then have a 7.3-inch full screen with the official name “Infinity Flex Display”. So the outer display can be used for simple operations that do not require a large screen such as calling, texting or checking the time. The infinity flex display comes in handy when you to deal with more complicated tasks like watching videos or playing games. Unlike Galaxy Fold’s design, the Mate X has a 6.6-inch main screen for general use. 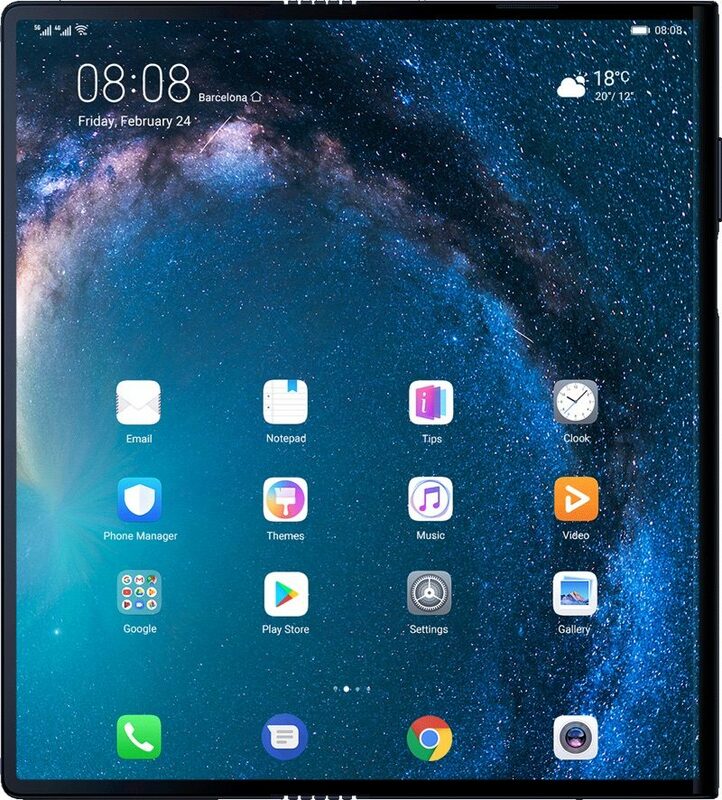 If you want a larger display, you can press a button on the right side of the phone, and the 6.38-inch additional screen will unfold from the back of the phone. The whole screen size of Mate X measures around 8 inches, larger than Galaxy Fold’s 7.3 inch infinity flex display. As the first foldable phone of each brand, the prices of Mate X and Galaxy Fold are surprisingly high. Mate X is 2,300 euros (about $2600) and Galaxy Fold is $1,980. Both of them will available from the second quarter of 2019. Although fans are eager to get a hold of one of the long-awaited devices, three main problems are yet to be solved before mass production. Foldable screen technology is still in its early stages. The core technologies behind foldable phones are display technology and hinge technology. Both of these should be able to withstand the test of being folded over 2,000,000 times. The hinge technology comes from laptops. However the quality and stability of the smartphone hinges is more important, as unfolding frequency will far exceed that of laptops. The biggest challenge is the display. All the phone’s screen has one layer of glass on top, and the glass is usually made very thin, and very fragile. That’s why many choose to use screen protectors, which protects the phone from being scratched and dropped, but it can’t be folded. The screen accounts for almost half of the phone’s total cost. Due to the high standard of foldable screens, the yield rate is very low and therefore it is very difficult to achieve mass production. So the first batch of foldable phones will not be affordable to most consumers. Foldable phones weren’t able to support Android systems until last December. At the 2018 Android Dev Summit, Android officially announced that apps on android platform would run seamlessly on foldable devices. Immediately after the summit, Samsung released its Galaxy Fold on Feb. 21, in Los Angeles. Huawei’s Mate X was released shortly after at the 2019 MWC. As of right now, not enough time has passed for developers and phone manufacturers to optimize apps for foldable phones. As for the user experience of android tablet, apps don’t usually run very smoothly and many apps don’t have a tablet version. That’s why the Mate X could only be viewed from outside its casing. Android tablet users will find that most apps can be installed just fine, but when you open the app, you may find that the UI and many functions have been simplified compared to the smartphone version. A bigger screen may be able to provide better experiences when watching videos or working from your phone. But bigger screens also mean more power consumption. A normal full-screen phone’s battery can usually last one full day. But even for the Mate X and Galaxy Fold, the 4,000 mAh battery will struggle to support such a big screen for an entire day. And apparently, the phone heating up after intensive use will greatly affect its performance. Due to its big screen and battery, the foldable phones will weigh more than the average phone and many consumers might not love the thought of having to carry around a brick like that everyday. Also, foldable phones can’t fit into phone cases, which may increase the risk of damage. Considering the high cost of fixing the screen, users may need to be more cautious with their foldable devices. After Huawei and Samsung released their foldable phones, many manufacturers also released their own foldable devices, such as Xiaomi and OPPO. Inevitably, they will face the same problems as the others. There is still a long way to go before foldable phones become generally accepted by the public.